Show the world how confident and cool you are with this trendy License Plate Messenger Bag. 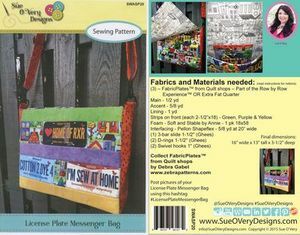 This sewing pattern is easy and fun. Collect FabricPlates during the Row by Row Experience in the Summer at different participating shops. Then whip up this super awesome messenger bag with adjustable shoulder strap, inside pocket, perfect bottom corners and watch how your bag will stand on its own. Features three FabricPlates and 2-1/2in pre-cut strips, Ghee's Black plastic hardware (1) 1-1/2in 3 Bar slide, (2) 1-1/2in D Rings, (2) 1in Black plastic swivel hooks, (1) package of 18x58in Soft and Stable foam from Patterns by Annie. Shown using three FabricPlates by Debra Gabel. Final dimensions: 16in wide x13in tallx3-1/2in deep.